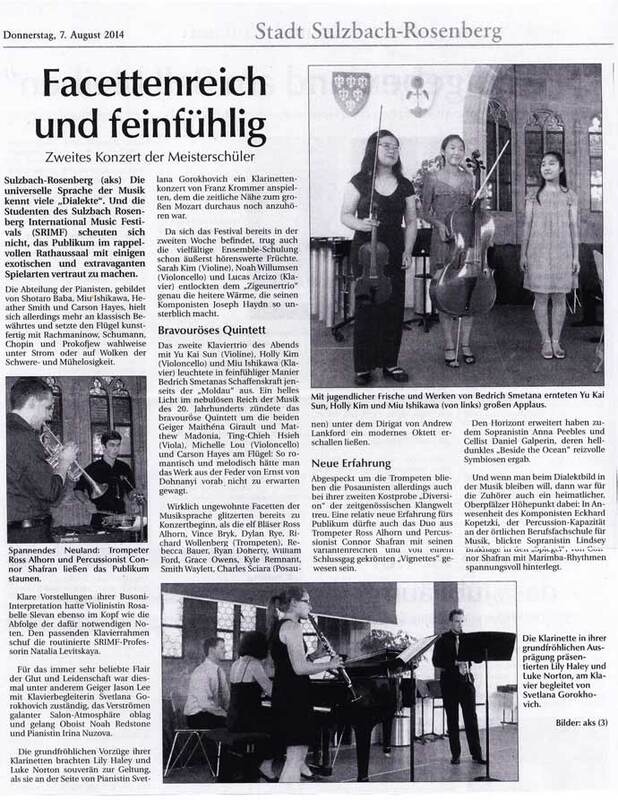 Sulzbach-Rosenberg (aks) The universal language of music has many 'dialects' – and the students of the Sulzbach-Rosenberg International Music Festival (SRIMF) did not hesitate to acquaint their audience with several exotic and extravagant ones. The contingent of pianists, Shotaro Baba, Miu Ishikawa, Heather Smith and Carson Hayes, stuck to a more classical program, however, and, with the music of Rachmaninoff, Schumann, Chopin and Prokofiev, electrified the grand piano - or transported it on to clouds of easy weightlessness. Violinist Rosabelle Slevan's Busoni interpretation was as clear in her mind as the notes upon which it was based. Seasoned SRIMF accompanist Natalia Levitskaya provided the appropriate frame on the piano. Jason Lee (violin) and accompanist Svetlana Gorokhovich provided the flair and glow of passion for which these concerts are loved; oboist Noah Redstone and pianist Irina Nuzova radiated a gallant salon atmosphere. Clarinetists Lilly Haley and Luke Norton showed off the cheerful character of their instrument to its best advantage, performing (alongside pianist Svetlana Gorokhovich) a clarinet concerto by Franz Krommer, whose historical proximity to Mozart could easily be heard. As the festival is already in its second week, the many-sided ensemble coaching has already begun to bear eminently musical fruit. Sarah Kim (violin), Noah Willumsen (cello) and Lucas Arcizo (piano) coaxed precisely that genial warmth from the "Gypsy Trio" which makes its composer, Joseph Haydn, so immortal. The second piano trio of the evening, with Yu Kai Sun (violin), Holly Kim (cello), and Miu Ishikawa (piano), illuminated with great sensitivity the creative power of Bedřich Smetana beyond the Vltava. The bravura quintet around violinists Maïthéna Girault and Matthew Madonia, with Ting-Chieh Hsieh (viola), Michelle Lou (cello) and Carson Hayes (piano), cast a bright light into the nebulous realm of 20th century music: one would hardly have dared hope to find the work of Ernst von Dohnanyi so romantic and melodious. Truly unfamiliar facets of the musical language glittered right from the beginning of the concert, when the eleven-member horn section (on trumpet: Ross Alhorn, Vince Bryk, Dylan Rye, Richard Wollenberg; on trombone Rebecca Bauer, Ryan Dougherty, William Ford, Grace Owens, Kyle Remnant, Smith Waylett, Charles Sciara), under the direction of Andrew Lankford, performed a modern octet. A slimmed down ensemble, without the trumpets, stayed true to the world of contemporary music in their second morsel, a "Diversion." A duo consisting of trumpeter Ross Alhorn and percussionist Connor Shafran may have been a relatively new experience for the audience: their "Vignettes" were filled with variations and crowned with a gag. 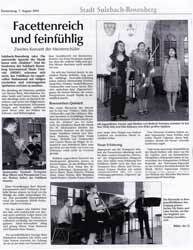 Soprona Anna Peebles and cellist Daniel Galperin also broadened horizons. Their chiaroscuro "Beside the Ocean" yielded charming symbioses. And, to stick with the idea of musical dialects, there was also a high point of native, Upper Palatinate charm: in the presence of composer Eckhard Kopetzki, the percussion teacher at the local Professional School for Music, Soprano Lindsey Brakhage looked into "the Mirror" to the accompaniment of Connor Shafran's tense Marimba rhythms.